RCC PLATFORM COPING Leveraging on our years of experience and in-depth knowledge of this domain, we are offering a quality-assured RCC Platform Coping to our prestigious clients. These RCC platform copings are highly known among the clients for their dimensional accuracy, longer functional life and fine finishing. Our expert professionals manufacture this product in adherence with the industry laid standards Et norms. 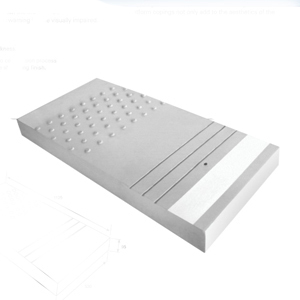 Our platform copings not only add to the aesthetics of the platform but also incorporate a tactile surface to aid as warning for the visually impaired. Overall Dimensions : 1125mm x 530mm x 100mm thickness. Manufactured by using M-30 grade of concrete by vibro compaction process using joint less FRP/GRP/Steel moulds so as to achieve shuttering finish.